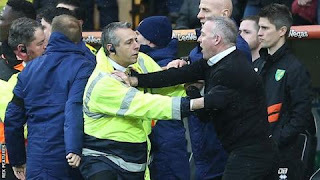 Ipswich boss Paul Lambert was sent off on his come back to Carrow Road as Norwich won the East Anglian derby to move 2 points clear at the top of the Championship. Tempers flared after Jon Nolan's late challenge on max Aarons in first-half stoppage time and Lambert was sent to the stands after confronting Norwich coach Chris Domogalla, who was also red-carded. The hosts had led after just 82 seconds when Onel Hernandez steered in from shut vary to attain Norwich's quickest league goal since 2011. Daniel Farke's Norwich move beyond Leeds, who drew at Middlesbrough on Saturday, whereas Ipswich stay 5 points adrift at the underside and 9 from safety.